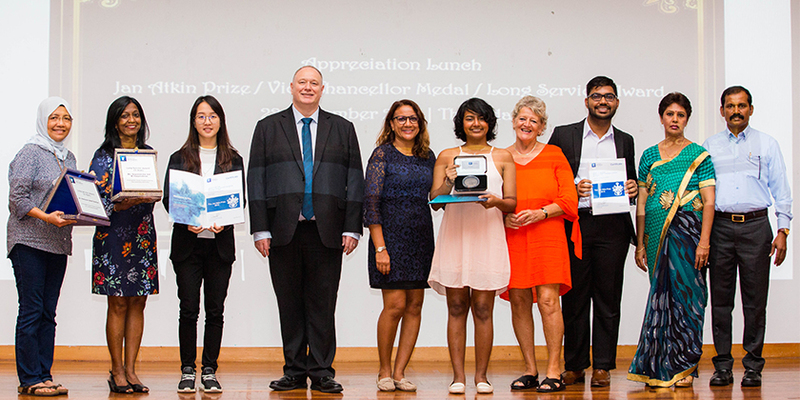 The Vice-Chancellor’s Medal and the Jan Atkins prize awards ceremony was held at the University of Nottingham Malaysia on Friday, November 22. Pr Graham Kendall presented both awards to the winners. The Vice-Chancellor Medal is awarded for exceptional achievement by the current staff or students of the University of Nottingham. Winners of the award would have contributed to advancing equality, diversity, and inclusion in university life or made notable endeavours which made a difference to the University, and within the local community. Winners may also have exhibited an individual achievement or sustained achievement over a period of time. The Jan Atkin Prize was established by Emeritus Professor Brian Atkin, former CEO of the University of Nottingham Malaysia, in the memory of his late wife, Jan. This prize aims to award-worthy students who have met both academic standards and who are deemed to have made the greatest contribution to the campus or to the community. Won the Global IChemE Young Chemical Engineer in 2012; numerous other awards; and actively promotes collaborations between industry, academia and policymakers. Encourages and motivates students and increasing the number of events for Clubs and Societies each year; coordinating and guiding events for the SA. Holds various key roles in the department to promote professionalism and to link civil engineering students/graduates with the industry via industry visits, seminar, talks and awareness of job opportunities. Represented UNMC at 3 international conferences; robustly involved in her local community through humanitarian work; committed teacher and volunteers on a weekly basis. Amplified the scale of the weekly “Enactus Bazaar” by launching numerous new services as Chief Finance Officer and the face of the Enactus Bazaar, opening avenues for a student to carry out entrepreneurial activities, and is part of the International Council of Malaysian Scholars and Associates. Student helper in the Malaysian Student Recruitment Team, enquiry centre; contributes continuously to the educational community through volunteer work as a member and teacher; and involved in research into school improvement and transformation initiatives in Sri Lanka. Spearheading the Model Commonwealth Summit to create a platform for young people in Malaysia to engage in the Commonwealth dialogue; representing the collective voices of young people and aspirations. The organiser for environmental and political groups; served on the Penang Green Council; involved in journalism for Singapore’s ‘The New Paper’; Editor in Chief for IGNITE student newspaper; and youth delegate to UN 23rd Conference. Instrumental in establishing the IEM-UNMC Student Section, officially launched in 2016; and initiated collaboration with Career Advisory Service to organise Campus Engineering Careers Day – now organised annually. An active member of SA; VP of Biosciences Students in Nottingham Society reviving this previously inactive society; SA Education Officer managing the Education Network; improving learning spaces on campus; and elected SA President for 2017/18 improving student community. International Relations year 2 student, President of an NGO (Imagined Malaysia); Co-curator of an important exhibition and restoration project at a major heritage site in Kuala Lumpur; selected by US Embassy in Malaysia for a course in religious pluralism; to participate in a study trip to the University of Tehran; and columnist with the Malaysian Insider. English and Literature year 2 student, Head Trainer of the Debating Club, President of the University’s Toastmasters Club. Spearheaded and organised a Youth Leadership Program for underprivileged kids in Semenyih and is a foundation representative of A Child’s Right to Education Project. Member of the International Council of Malaysian Scholars and Associates. Economics and International Economics year one student, President of JCI Youth UNM 2017/2018, led the Partnership Project to build homes for indigenous families in Kampung Sungai Lalang, organised the Aspiring Youth Leadership Conference 2018, invited and welcomed the CEO of EcoWorld and the CEO of AirAsia X to this program. Member of the International Council of Malaysian Scholars and Associates.